London, The Pindar Press, 1986. FIRST EDITION. 8vo, pp. 124. 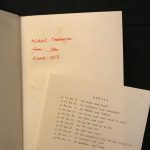 Author’s presentation copy dedicated to his friend scholar and poet Michael Hamburger, inscribed in red ink on the front endpaper: “Michael Hamburger / from John / May 1986”. 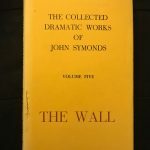 Bound in buckram, title to spine, with original dust jacket; just a tear along front hinge of dust jacket. With errata slip insert. An excellent copy.